The apartment no. 3 has 40 square meters and is located in the basement of our Bad Kissinger Ferienpension. It has a large living room with double bed, sitting area, and dining area. Windows on three sides give a wonderful view of the green garden. The small kitchen, shower, toilet, and a small hallway complete the apartment, which can be reached via a private entrance. The apartment house with a unique view of Bad Kissingen. 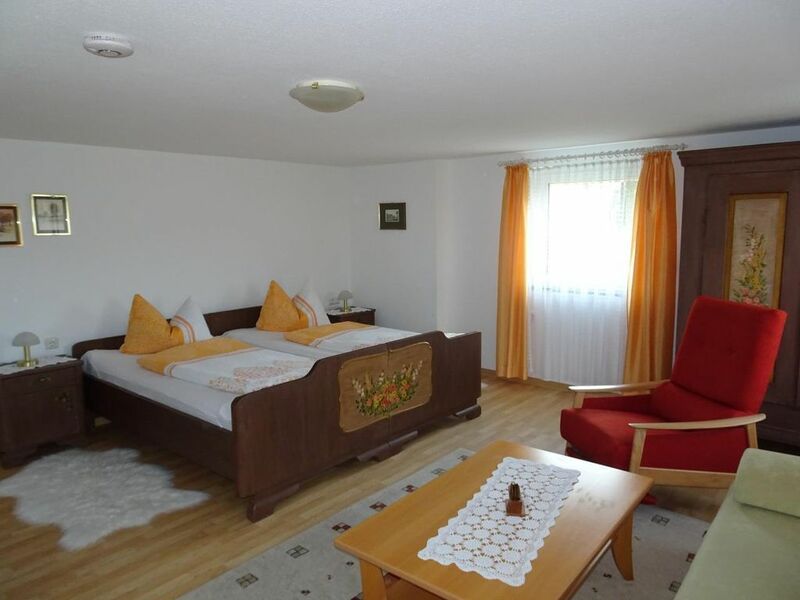 Our property is located in a quiet residential area (near the KissSalis-Therme) and about 3 km from the city center. By paying the tourist tax (until 31. 12. 2018 3,50 € / pers./ Day, severely disabled 3.00 € / pers./ Day, conference participants and professional stay 1.75 € / pers / day, children and adolescents up to 18 years free from 2019 + 0. 10 €) you can u. a. on the weekdays use our city bus line free of charge and get to your stay in the spa after presentation of the guest card one hour for free. - City tax / tourist tax: per person and day costs of 3. 6 EUR (optional). - Towels: to rent per person per week for 3 EUR (optional).